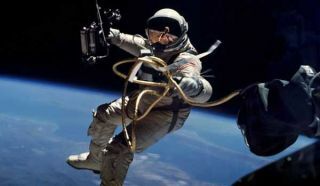 FAQ: How Do Astronauts Take Spacewalks? A new study suggests that long-duration space travel can weaken astronauts' bones for a year or more after they return to Earth. Here, astronaut Ed White performs the first American spacewalk during the Gemini 4 mission on June 3, 1965. Whenastronauts fly in space, they depend on the health of their spaceships, though everynow and then equipment or experiments need replacement, or damaged items needrepair. But with terms like EVA and EMU hovering around, spacewalks can seem liketricky business. ?Here are some basic questions and answers onhow astronauts take walks in space. Whatis a spacewalk (and what's an EVA)? Whenastronauts leave the protective confines of a spacecraft ? such as the spaceshuttle or International Space Station ? and float around in the vacuum ofspace, that's called a spacewalk. NASA refers to these jaunts as extravehicularactivities (EVAs), because they take place outside the vehicle. Whatdo astronauts wear during a spacewalk? Whenleaving the pressurized, air-filled environment of a spacecraft, astronautsmust don protectivesuits to keep their bodies safe from the harshness of space. NASAastronauts wear what's called an EMU (extravehicular mobility unit), whichincludes a protective white suit and a strap-on pack that provides oxygen andother life support necessities. While wearing an EMU, astronauts breathe 100percent pure oxygen, and are pressurized to about 1/3 atmospheric pressure. TheEMU suits also contain a drink bag so spacewalkers can sip water duringspacewalks, which usually last between five and eight hours. What'sthe purpose of a spacewalk? Spacewalksallow astronauts to make repairs or install equipment on the outside of aspacecraft. The InternationalSpace Station, the world's largest construction in space, requires frequentspacewalks for astronauts to add additional rooms or hardware to the orbitinglaboratory, or replace aging equipment. Numerousspacewalks over the course of four servicing missions to the HubbleSpace Telescope have allowed astronauts to make repairs and upgrades to thefamous observatory. Additionally,astronauts can perform scientific experiments during spacewalks to test howspace affects different materials and equipment. Whydon't spacewalkers and tools float away? Astronautstie themselves to the spacecraft using safety tethers to make sure they stayconnected at all times. Spacewalkers also tether tools to their spacesuits sothese don't float away either. Still, a number of tools have been lost to spaceduring spacewalks ? including twoobjects lost during a Russian spacewalk conducted July 27, 2010. Justin case a tether breaks, astronauts also carry a system called Simplified Aidfor EVA Rescue (SAFER) on their spacesuits. This system uses small jetthrusters that astronauts can control with a joystick to maneuver around inspace and make their way back toward a spacecraft if necessary. It'stough to train for the complicated maneuvers of a spacewalk while on theground, because there is no way to simulate the weightlessness spacewalkerswill feel. The closest NASA can get is a giant swimming pool called the NeutralBuoyancy Laboratory at the Johnson Space Center in Houston. There,astronauts can swim around in a tank containing 6.2 million gallons of water. Spaceflyers wear spacesuits in the tank and practice onapparatus set up to simulate as close as possible the tasks they will haveduring their EVA. Practice sessions often run the full, uninterrupted length ofthe spacewalk to help astronauts build up the endurance they will need. Thisarticle was provided by Life'sLittle Mysteries, a sister site of SPACE.com.